The highlight of the Vorpommern-Greifswald District is the Baltic Coast and the sandbanks at and around the Usedom island. Plus, it is protected within the Stettiner Haff, a large harbor shared with Poland. This mostly flat region sits in the valleys of the Uecker and Randow rivers. 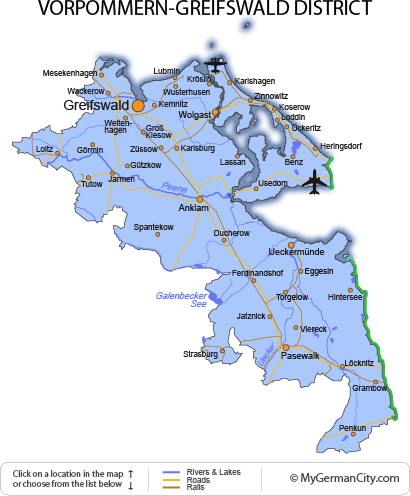 It is also one of the least developed regions in the whole of Germany. The Vorpommern-Greifswald District is a great place for outdoor adventures, and is covered in lakes, forest and heath with some steppe flora unique to the area. It has a small area for wine production, too. By the way, you can visit a Mushroom Museum here and walk to Poland across one of the pedestrian border crossings. In the port town of Ueckermünde, you will find some great seafront architecture and plenty of comfortable double deckchairs on the sandy beaches. Add to this endless streets of half-timbered buildings and gabled merchants houses to wander through for good measure. It is also home to the last palace of the Dukes of Pomerania still to be found on German soil. Its main island with many bays, lagoons and inlets is known as Usedom and is half-owned by Poland. It is the second largest island in Germany after its neighbor, Rügen. It holds many of the regions seaside resorts including Heringsdorf which has the Heringsdorf Airport (HDF), a traditional pier, an observation tower, and many great houses and mansions on the waterfront. The Usedom island also protects the estuary of the river Peene, which helps to surround the ancient Hanseatic city of Greifswald on the eastern coast. Anklam in the center is also Hanseatic and still well fortified. The busy town offers considerable river trade opportunities and is well known for its shipbuilding. Its extensive agricultural lands away from the coast have filled its ships with produce over the centuries and continues to do so today, keeping the town’s docks alive.